The Global Volcanism Program has no activity reports for Nosy-Be. The Global Volcanism Program has no Weekly Reports available for Nosy-Be. The Global Volcanism Program has no Bulletin Reports available for Nosy-Be. Nosy-Be island off the NW coast of Madagascar contains very recent basaltic lava flows from well-preserved cinder cones. Many large crater lakes are found in the central part of the island. A predominance of low-silica foiditic compositions overlie Mesozoic limestones and other sedimentary rocks. The two periods of activity have consisted of initial eruptions of fluid lava flows from the W side of the massif, followed by the construction of numerous strombolian cinder cones on the W plain. Little is known about the age of the volcanic field, and the only K-Ar dates are Tertiary in age, but the volcanics were mapped as Recent (Besairie, 1973). Besairie H J, 1973. Precis de geologie Malgache. Annales Geol Madagascar, 36: 1-141. Melluso L, Morra V, 2000. Petrogenesis of Late Cenozoic mafic alkaline rocks of the Nosy Be archipelago (northern Madagascar): relationships with the Comorean magmatism. J. Volcanol. Geotherm. Res., 96: 129-142. The Global Volcanism Program is not aware of any Holocene eruptions from Nosy-Be. If this volcano has had large eruptions (VEI >= 4) prior to 10,000 years ago, information might be found on the Nosy-Be page in the LaMEVE (Large Magnitude Explosive Volcanic Eruptions) database, a part of the Volcano Global Risk Identification and Analysis Project (VOGRIPA). There is no Deformation History data available for Nosy-Be. There is no Emissions History data available for Nosy-Be. 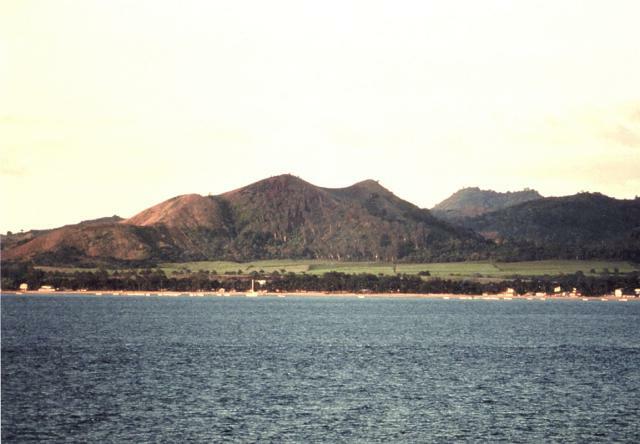 Cinder cones line the shores of Nosy-Be island off the NW coast of Madagascar. The youthful-looking cones have produced very recent basaltic lava flows. Many large crater lakes are found in the central part of the island. Nosy-Be volcanics overlie Mesozoic limestones and other sedimentary rocks. Two periods of activity occurred at Nosy-Be. Initial eruptions of fluid lava flows from the western side of the massif were followed by the construction of numerous strombolian cinder cones on the western plain. There are no samples for Nosy-Be in the Smithsonian's NMNH Department of Mineral Sciences Rock and Ore collection. Large Eruptions of Nosy-Be Information about large Quaternary eruptions (VEI >= 4) is cataloged in the Large Magnitude Explosive Volcanic Eruptions (LaMEVE) database of the Volcano Global Risk Identification and Analysis Project (VOGRIPA).